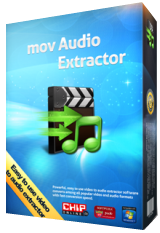 mov Audio Extractor is able to extract MP3, WAV, WMA, AAC, AC3, OGG, FLAC, M4a and more audios from videos without sound quiality loss. Now you are free to convert the fresh new music videos to audios, so that you can enjoy them on music players of tweak them in audio editors. Convert all music to MP3, which is widely accepted by computers, media player applications and portable devices like iPhone/iPod/iPad, Android, Windows phones and tablets etc. It comes with superb audio quality up to 320 KBps. mov Audio Extractor enables you to run up to 16 parallel conversion processes to make the most of your computer.